Is a trip to Canada, Mexico or another foreign country in your upcoming travel plans? 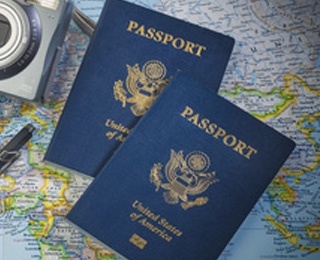 The U.S. Department of State is predicting a “record-breaking high demand for passports in the next two years” because of the 10th anniversary of the Western Hemisphere Travel Initiative. The initiative, implemented in 2007, expanded passport requirements for U.S. citizens entering the U.S. from Canada, Mexico, Bermuda and the Caribbean. Millions of U.S. citizens applied for their first passport and since adult passport are valid for 10 years (5 years for children under 16), millions of passport holders will be renewing in 2017. “If you think you will need a passport in the next year or so, we encourage you to apply now. Most countries require you to have at least six months of validity left on your passport to enter. Don’t wait until right before your trip. If you are not sure when your passport expires, pull it out and check the expiration date. Apply early, and spread the word,” urges the State Department. You can apply online, unless you are applying for your first passport. Then you must apply in-person at a library, post office, county clerk offices or other public agency. Check the state department list to find the nearest location. And while you’re on the site, learn how you can sign up for Smart Traveler Enrollment Program, a free service to alert you to unsafe conditions and warnings in the country and help family members reach you in case of an emergency. Before you leave home, make two copies of your passport. Leave one with family, and bring the second one with you, stowing it somewhere other than with your passport. Now that you’ve got the passport issue resolved, time to put together your trip. It’s never been easier to book hotels, airlines and excursions online. You can compare costs, read ratings and comments from other travelers and pick up lots of local knowledge. But if you are undecided, how do you decide where to go? Guidebooks, travel agency brochures and recommendations from family and friends also are a great source. Destination in place, here are some websites to review for hotels and other travel needs. If you are heading to Europe, be sure to check out renowned traveler Rick Steves, whose 40-year-old company now features a website, a public television series, a public radio show and more than 50 guidebooks. TripAdvisor®, which bills itself as the world’s largest travel site, lets you search for hotels, flights, restaurants, and more, by price and reviews. Other popular travel sites include Expedia, Booking.com and Priceline.com. Many travelers stop at a local bank before heading overseas to exchange a minimal amount of U.S. dollars for foreign currency. Local currency comes in handy for cheap eats, taxis, buses and the like. But since the exchange rate is generally more favorable in its home country, it’s best to wait until you arrive at your destination to get the bulk of cash. That said, a few things to keep in mind before you leave home. If you plan to use an ATM, be sure to contact your bank to discuss your travel plans. You will probably need a PIN code as well. And once there, try to use an ATM located outside a bank. “A thief is less likely to target a cash machine near surveillance cameras, and if your card is munched by a machine, you can go inside for help,” Rick Steves writes. To exchange U.S. dollars for local currency, you have a couple of options depending on the country you are visiting. Canadian banks, for instance, are likely to exchange U.S. dollars for a small fee, but British banks will only do so if you are have an account. Currency exchange businesses are plentiful, especially in airports and cities, but make sure fees are minimal and the exchange rate is favorable. No matter how much cash you bring or exchange, it’s always good to bring a credit card, even if you only plan to use in an emergency. Be sure to contact the credit card company beforehand with your travel plans, and inquire about foreign transaction fees. If you plan to primarily rely on a credit card for your travel expenses, try to find a card that does not charge a foreign transaction fee, which can be as high as 3 percent. A smart phone sure comes in handy while traveling overseas, replacing bulky guidebooks and maps with free apps for just about everything. But international rates can be expensive unless you purchase a global plan beforehand. (Be sure to cancel when you return.) And use free Wi-Fi whenever possible. Rick Steves calls it “traveling as a temporary local.” For instance, the British place a high value on speaking quietly in restaurants and on trains. “Listen while on the bus or in a restaurant – the place can be packed, but the decibel level is low. Try to adjust your volume accordingly to show respect for the culture,” he writes. Dress code, tipping protocol, waiting in line, greeting words and gestures – these are just a few ways our behavior may vary greatly from the residents of our host country. Certainly reading up on a country’s culture beforehand can help, but once there, be observant. Attend a sporting event, such as soccer or cricket. If your trip coincides with a holiday or other annual observation, find out where and how the locals celebrate, and, if open to outsiders, join in. Speaking and understanding the language certainly helps travelers get a real feel for the people and their culture. Before your trip, you could sign up for a language class, practice with a CD, or online with Duolingo or other language site. While traveling, use a translator app for your phone. Many are free, but for a fee offer additional features, such as voice recognition. Don’t rely on Medicare coverage, according to the U.S. State Department. Carry medication in its original, clearly marked container. Depending on the health risk associated with the country you are visiting, the Centers for Disease Control and Prevention may recommend vaccinations and medications. Adjusting to a different time zone can rob you of valuable travel time. To minimize jet lag disruption, reset your watch to the new time zone as soon as you board the plane and use an eye pillow and earplugs to help you sleep during the flight. Remember that daylight can help reset your internal "clock” so take a one-hour walk as soon as you get up in the morning.